South-eastern Thailand and peninsular Malaysia. It’s found most often in fast-flowing, sandy-bottomed streams. It lurks among submerged tree roots, rocks and other refuges during daylight hours, emerging at night to feed. It’s a shy, nocturnal species so it’s best to keep the tank dimly lit. Provide plenty of hiding places using upturned flowerpots, lengths of plastic piping, tangles driftwood etc. Plants aren’t essential but are useful in cutting out the amount of light hitting the bottom of the tank and providing extra cover. If you’re keeping it alongside other similarly-sized catfish, or as a species group, arrange the decor to form distinct territories. Try to position the heater in such a way that the fish will not be tempted to rest under it, as it’s a scaleless species and will burn easily. The water should be very well-oxygenated and have a degree of flow to reflect its natural habitat. Predatory by nature, but usually adapts well to dead foods in captivity. It relishes meaty items such as prawns, mussels, cockle, lancefish or earthworms. Most specimens will also take dried sinking foods. When first introduced it may only feed after lights out, and food should be added accordingly. Once settled most will learn to come out and forage for food. Females generally have a stockier profile than males. Males possess a noticeable, elongate genital papilla. This fish is usually imported as Pseudomystus stenomus but actually seems to be an undescribed species, as it’s collected from the Malay Peninsula. P. stenomus is endemic to the island of Java and supposedly exhibits a higher degree of light-coloured patterning on the body. 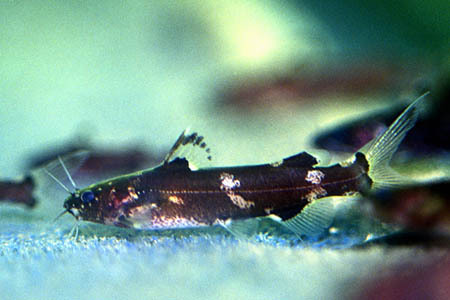 The genus Pseudomystus contains many similarly-patterned species, of which the most common in the hobby is the Asian bumblebee catfish, P. siamensis. This can easily be distinguished from P. sp. cf stenomus by its characteristic striped “bumblebee” patterning. All Pseudomystus were formerly included in the genus Leiocassis, and are still referred to as such in a great deal of the available literature.